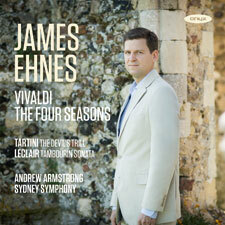 James Ehnes takes a break from the 19th and 20th century repertoire and has recorded for the first time in his career four of the most famous baroque violin concertos – Vivaldi’s Four Seasons, the first four works in his set of 12, op8. James also directs the Sydney Symphony. Vivaldi provided his own sonnets as prefaces to each of the concertos and these are available from the ONYX website. The Vivaldi is prefaced by two famous violin sonatas – Tartini’s Devils Trill in the skilful arrangement by Fritz Kreisler which is very faithful to the original text, to which Kreisler adds the famous cadenza in the finale. Leclair, one the few composers to have been murdered, was known as ‘The French Corelli’. Of his op9 set of 12 sonatas for violin, the third has become the most popular for its ‘Tambourin’ finale, depicting a pipe-and–drum dance with drone effects - all good fun!